It’s pretty simple - start with the pinky on one hand and count each finger including your thumbs and what do you get? 10? Most people get 10. Logically if you start in 2011 and count backwards 10 years then you reach 2001. Most people get 2001. And if it’s May and you count back to January 2001 you get 10 years and five months, which is more than 10, not 10 or less. This simple review of math has a point and the point is that no matter what your enterprise read the fine print and double check your sums. Team Red Thread is the proud owner of two cars in the UK because, well, we’ll just blame it on age and over-excitement and a near complete inability to calculate figures that are bigger than the number of fingers on our hands. Having proudly announced our acquisition of a Suzuki Wagon R we can now proudly say that car is up for sale at a bargain price. Just contact us. It’s in great shape, has an MOT and tax and is ready for it’s next 60,000 miles. In its place we have acquired another Suzuki. 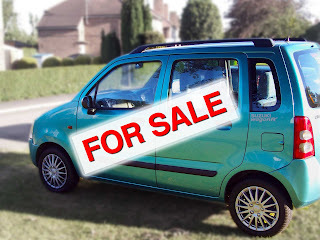 This time a three door 1.0 litre Swift. Driven by a little old man on Sundays it has less than 50,000 miles, electric windows and unlike the wagon actually meets the rules laid down by the Mongolian government. We’re excited. We hope you are, too.